There are some questions which seem to be asked frequently, or searched for frequently, so although many of the answers appear elsewhere on the site, I thought I'd gather them onto one page for easy access! A coin for the phone - in an era when mobiles didn't exist, to use in call boxes, or to pay the owner for making a call from a private phone. Current Pocket Book or Record Card - as well as handbooks, our challenges were printed in a pocket-size format so they could easily be carried and referred to. Prior to 1990, there were set positions for badges to be worn on uniform - these were published in 'Policy, Organisation and Rules', the 'Guide's Book of Rules' and in the handbooks, so these should be referred to when judging where badges were to be positioned in the past. No badges other than those on the list were permitted on uniform, under any circumstances. 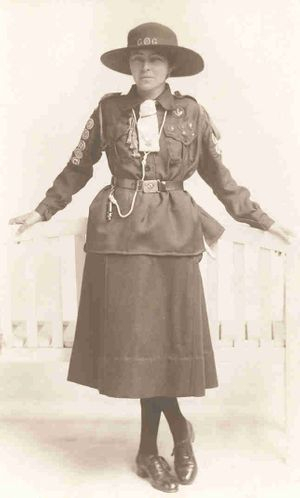 If you are 're-creating' old uniforms by adding badges to period blouses/dresses to create a sample uniform of a particular era, please research carefully to make sure all of the badges used are of the right era, and that the 'story' adds up - can't go giving a uniform a 'Little House' emblem if you haven't also got all the right interest badges needed to earn one, or ignore details like the Brownie Six badge changing side in 1931! Post 1990, this ceased, and it was then entirely up to the individual whether or not they wished to sew badges on sashes, and if they opted to do so, where each was positioned. Some units may choose to invent their own byelaws or even issue unofficial diagrams, but even then it is up to the individual whether to follow these local suggestions or not, as such unit byelaws were initially very strongly discouraged! Nevertheless, sashes should always be worn on the right shoulder, with the notch at the neck! Part of Brownie Traditions badge, the badge the Brownies worked for wasn't commonly known by that name, it was usually referred to as Golden Hand - even in the official publications! After passing their 'tenderfoot' tests (the equivalent of modern pre-Promise work) the Brownies worked for Golden Bar (the lower of the two badges shown), and had to pass set tests, these could be passed gradually. The badge was worn above the left pocket on the frock, as seen below. Once Golden Bar was earned, the Brownie could start practicing the skills for her Golden Hand test - but it was only practice, because the actual testing of Golden Hand was all done on one day, by an independent Guider. In the 1950s, "Golden Ladder" was introduced, to bridge the gap between the Golden Bar and Golden Hand tests - it enabled Brownies to get a second Golden Bar badge to stitch above the first if they passed certain intermediate clauses as a stepping stone to Golden Hand - and it also allowed those who would not pass Golden Hand, to have a target to aim at. Brownies could not gain interest badges until after they gained Golden Hand. Brownies who gained Golden Hand got to 'Fly Up' to Guides, and received a "Brownie Wings" badge to wear on the sleeve of their Guide uniform. Those who did not pass Golden Hand would "Walk Up" to Guides and did not receive the wings badge. 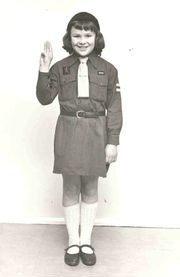 This is why many pre-1968 Brownies had very few interest badges - there was often little time left between passing Golden Hand and moving up to Guides. Later, Brownies were allowed to gain two interest badges (plus thrift) before completing Golden Hand, which helped make interest badges a little more common. It was on ly in 1968 that Brownies were free to start earning interest badges as soon as they had made their Promise. Lay the tie out flat on a table, long side towards you. It works best if it is ironed and starched. Fold the pointed end up to the hem of the long edge, then repeat twice. You should now have a long narrow strip of fabric - now for the tricky part - tieing the tie! Fold around 1/3 of the length of the strip up the back, leaving a longer working end in front. 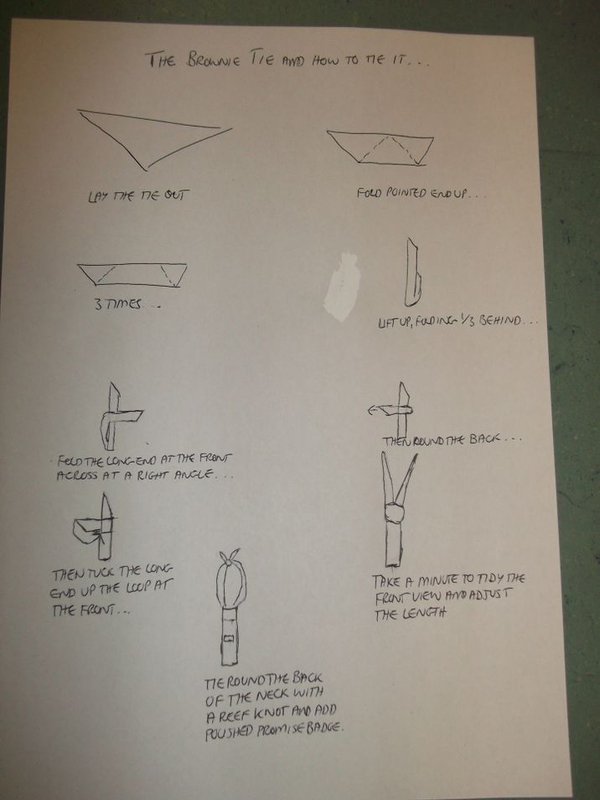 Lift it up now and fold the longer end at right angles, then round the back and round again to the front. Then tuck the end up through the loop you have just made, so that you have a shape like a necktie. At this point, take a minute to adjust the length of the tie, tidy up any crumples around the knot, etc. Then tie on the tie using a reef knot at the back of the neck. Add on a carefully-polished Promise badge of the right era in the middle of the tie. Ideally, the end of the tie should be about 3 fingers above the belt, but nowadays there sometimes has to be a degree of compromise between this and strangling the wearer! Originally, Brownie ties were only available in brown, later the dark gold colour was introduced, each unit had to decide which colour to have, soon the more colourful gold colour was by far the most common. The first step is to note down what you already know. What is the unit's current name, do you know of any past names or mergers? Where do you meet now and have you always met there or do you know of previous locations? What former Leaders do you know of, and can they help to fill in some of the blanks? Do other local Leaders (especially those who have been involved in Guiding for a while locally) have information or recollections which could be helpful? There may be a date quoted on 'GO', but for most units of any age a generic date of 1 January 1900 was used, which is a nonsense date. The next step is to approach your County Secretary - she will have access to the official records which your County holds on the unit. These will probably give the official registration date (and any gaps where the unit was closed and re-opened), and they may give the names of the former Leaders (in my area they usually have complete records of Leaders back to the 1960s but not necessarily earlier - but this may vary). If you can give the Secretary plenty of time to look up the records (she has to fit it in amongst all her other more pressing duties) then she will be able to give you all the information that she has. Once you have these bare bones, the search proper can really begin! If you've met at the same place for a while, might they have records of how long - perhaps the treasurer has an old accounts book with a list of rent payments which you could trace back, or the booking secretary has some old correspondence, or the owners might have a minute book where your hire request was discussed or noted, or your rent rise was minuted - these small details can all help to fill in where you met and when, and who the leader was at the time. Is there a local history club and do they have any information on Guiding in your area in the past? Do local newspapers have a searchable database, which would allow you to search for articles? ( Some national papers like The Times do too.) Does your County publish an annual report, or regular newsletters, or did it used to - could you access the back copies to search for references to your unit? Remember that County boundaries may have changed over the years - did your unit used to fall under another District or County, and might they have any records of your unit from that time? Do you have contact details for any of the former Leaders (perhaps gleaned from the information the County Secretary had), and do they have recollections, photos, or even log books from the past? Does your County Archivist have any information - they might have old logbooks, reports, photos, records of County events, and other snippets of local District or County activities which your unit might have been part of. What about former Leaders of other units - if you know Flossie used to run the Wednesday Guides back in the 1950s, then she was likely to have known who was running the Monday Guides at that time, where they met, about some of the events both units were involved in . . .
Don't forget to keep your net wide enough when searching - if there was a Divison or County unit event then your unit might well have participated, even if the information doesn't explicitly say so - so search for larger events like County Camps, Rainbow Riots, and Brownie Revels. With Senior Section units, be aware that if their history stretches back pre-1968, then they would probably have started as either Land Rangers, Sea Rangers or Air Rangers, or maybe even as Sea Guides or Senior Guides - can you find out which? Then there is the 'legwork searching' - searching through back copies of "The Scout", "Girl Guides Gazette", "The Guide", "The Guider", "Today's Guide", "Guiding", "The Brownie", "Senior Branch News" and "The Ranger", as appropriate, to see whether your unit is mentioned on the letters pages, or in the badge honours. I recently found an entry for one of my local units back in 1926 in "The Guide" - sadly it's an obituary for a Guide who had 'passed to higher service' as they termed it - but it gives me written confirmation that the unit was running at that date - and that they subscribed to the magazine and so might have submitted other items around that era too. I then also found a letter in a 1931 issue of "The Guider" from the Leader of that same unit, where she happens to mention that it has been running for 10 years - so I now have confirmation of who was the Leader in that era, and also of how early the unit existed - at least 1921! Local newspaper archives will often have a library of back-copies, sometimes on microfiche or online, sometimes original copies, which you may be allowed to access. There is no guarantee of finding anything on the unit you want, but during your search you may find useful background, or information on other neighbouring units which you can share with them - and you might just get lucky . . . and some church magazines have been running a long time - wonder how good they are on keeping a library of back copies . . .
And finally - if you are interested, then so might future generations be - so do catalogue whatever you manage to find out and it's source, add in details of the current unit set-up for future reference, and store it safely, on paper, so the next person who enquires has a head start and doesn't have to repeat all your hard work - it's amazing how many meticulously-kept log books tell you lots about what they did, with write-ups, photos and cuttings - but don't give any details of who the author of the log book is!